The curious nickname of 'Sprat and Winkle Line' (or sometimes `The Parsons and Prawns'!) has always been applied to that portion of the London and South Western railway running between Andover and Redbridge, in Hampshire. The reason is hard to discover, unless it is from the fact that the southern extremity of the line touches the mudlands on the tidal portion of the river Test, where, perhaps winkles may at times be found. But it is questionable whether the silvery sprat is often to be met within its waters. Just as likely, the name may derive from the nickname of a particular style of railway coupling! The Andover and Redbridge canal, that formed the nucleus of the present railway line, was constructed as far back as 1792 or, at any rate several miles were then in operation. For many years this old waterway was used to considerable advantage by the towns and villages which it served, until the railway mania began to disturb the minds of local financiers and landowners. It was decided to convert the canal into a railway with the idea of shortening the distance between Andover and Southampton. In 1857 the canal company changed its name to the Andover Canal & Railway Company. On 28th September 1859, the first sod was cut by the Rt. Hon. Lord Palmerston K.G. 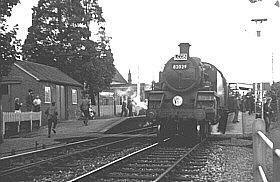 and the Andover and Redbridge Railway was opened for traffic on March 6th 1865. It was a single line with crossing loops at the stations for trains to pass one another, when necessary. 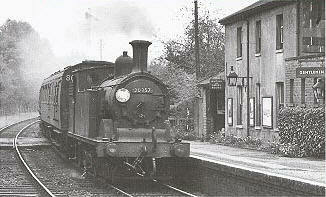 Passenger trains took about 90 minutes for a 28 mile journey. It performed sterling service during the 1st and 2nd World Wars, carrying troops from Salisbury Plain for embarkation to France via Southampton. The district between Andover and Redbridge was purely agricultural, but being in the valley of the river Test, noted for its famous trout fishing. There was a large amount of passenger traffic during the season, and Stockbridge, with its numerous racing stables, added its quota in the way of conveyance of race horses to and from the various meetings. 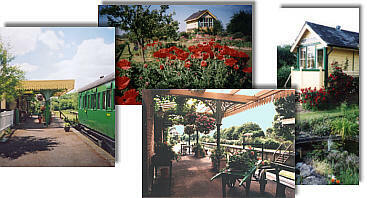 First opened in 1865, Horsebridge was an unusually large station with sidings taking up what is now the paddock and Test Way Car Park, with The Railway Inn (now the John of Gaunt) the local hostelry. 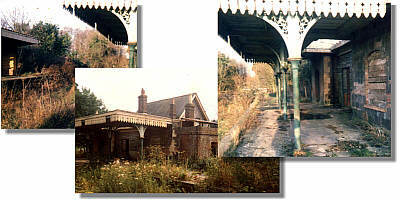 Horsebridge operated as a very busy country station until closed in 1965 as a consequence of swingeing economy measures invoked by the Chairman of the British Railways Board, Dr. Beeching. Left to become derelict for 20 years, it was bought by its present owners, Tony and Val Charrington in 1985, and restored to create its present charming and nostalgic atmosphere.